Most people don't think much about walking until a problem arises. If your legs tire when you walk long distances, or if you notice your balance is "off," the muscles that support you and power your stride might be weak. For a well-rounded program that targets the walking and balance muscles, do a variety of exercises for your legs, glutes, ankles, feet and core. Take a day off between workouts to give your muscles a chance to rest and recover, and finish off every workout with a thorough lower-body stretch routine to promote flexibility and prevent soreness. Perform mini squats to build strength in your glutes, quadriceps and hamstrings. Stand with your feet shoulder-width apart, your back straight and your chin level. Hold on to a chair or the wall for support if needed. Tighten your stomach muscles and slowly bend your knees until your thighs are almost parallel with the floor -- or as far as you can. Allow your hips to shift slightly backward as you lower your pelvis. Hold for five seconds and then slowly straighten your knees. Complete two or three sets of 10 to 15 repetitions. To increase intensity, hold a dumbbell in each hand. Walk on your heels to strengthen your tibialis anterior tendons, or shins. Stand with your feet slightly apart. Place your hands behind your back, engage your stomach muscles and rock back onto your heels, flexing your toes upward. Walk around for 30 seconds without lowering your toes. Rest for 30 seconds and then repeat once or twice. Complete two or three sets of calf raises to boost strength in your calves and ankles. Stand on a step with the balls of your feet near the edge of the step and your heels extended beyond the edge. Slowly rise onto the balls of your feet, keeping your insteps directly over your toes. When you’ve lifted your heels as high as possible, slowly lower them, allowing them to drop below the level of the step. Repeat 10 to 15 times. Rest briefly between sets. For greater intensity, work one leg at a time or hold dumbbells. Target the small intrinsic muscles of your feet with towel scrunches. Sit in a firm, stable chair and spread a hand towel on the floor near your feet. Place your feet on the towel and scrunch up your toes, drawing the towel toward you. Release the towel, and then repeat the scrunching motion 10 to 15 times. Smooth out the towel and repeat the exercise a total of two or three times, resting briefly between sets. Work on ankle strength and balance by doing proprioceptive exercises. Stand with one foot flat on the ground and the other leg bent at the knee with the foot directly behind you. Balance for 30 seconds or up to several minutes and then switch feet. If the exercise is too easy, keep your eyes closed or stand on an unstable surface, such as a soft pillow. As your ability to balance improves, bend and straighten the working knee 10 to 15 times. Combine strength and balance training by hopping on one foot at a time . Put your hands on your hips and engage your core muscles to stabilize your lower back. Hop on your right foot 10 to 15 times. Rest for 30 seconds and then repeat for a total of two or three sets. Repeat on your left foot. As your balance and stability improve, change directions when you hop, moving forward, backward and side to side. As well as having many types of applications, a curved treadmill has many health and performance benefits. 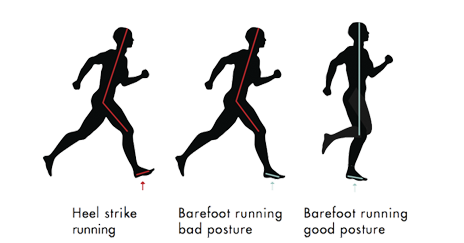 Due to the propelling technique required to drive the running belt forward (similar to running outside), the curved treadmill recruits more muscles (glutes and hamstrings) throughout your run. By minimising the vertical displacement of the body’s centre of mass (COM) on the curved treadmill there is a coinciding increase in energy expenditure. The design encourages you to run on the balls of your feet, which in turn reduced the impact on joints and improved running performance. There is more core and trunk engagement due to the need to run at an ergonomically correct angle. This forces you to maintain proper posture otherwise you will feel off balance and will effect your running gate. Mean average calorie expenditure has been shown to be 30-40% higher on a curved treadmill compared to a flat treadmill whilst only walking at 3 miles per hour for 10 minutes. Increased Rate of Perceived Exertion (Borg Scale 6-20) has been demonstrated to be around 1.44 units higher on a curved treadmill compared to the conventional flat treadmill. That’s the difference between very light and light exercise. An increased heart rate by 22% and relative VO2 was 41% greater at the same speed on a curved treadmill. Due to the curved treadmill is being completely powered by the user, it is simple and quick to get started. Simply jump on and shift your body weight forward to walk, jog or run, no buttons involved. Best of all, there is no electricity required.